It also provides numerous links to various case studies and examples of real people’s struggles with this Wound. What is the Anti-Selling Wound™? The Anti-Selling Wound™ is the fear that people won’t like it if you try to sell them anything (or “push something” on them), and this makes you extremely resistant to any act of salesmanship whatsoever. The “Bend Over Backwards” archetype – a tendency to be a bit of a pushover with your clients. This can show up in a variety of ways, from under-charging for your services to having a non-existent return or cancelation policy. The power play behind the Anti-Selling Wound™ is the one between you and your customer, or prospective customer. Are you suffering from this Wound? Most entrepreneurs and small business owners suffer from the Anti-Selling Wound™ to some degree or another. Which Wounds are often related? One of the two manifestations of the Anti-Selling Wound™ is an unwillingness to do marketing & sales for your business. You don’t send your newsletter, don’t update your website, don’t return calls to prospective new clients, don’t attend networking events, etc. 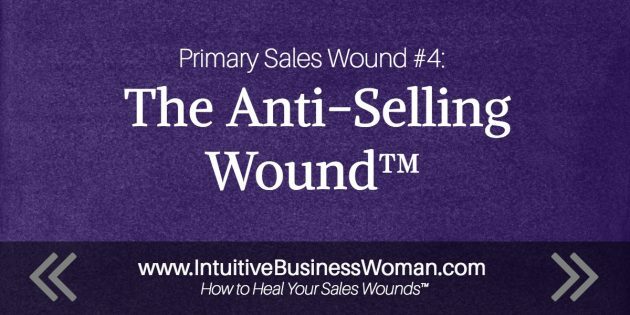 Read more about this manifestation of the Anti-Selling Wound™ here, as well as suggestions for how to turn it around.